One of the most frequent requests that we encounter at InVision Construction is for a bathroom remodel. 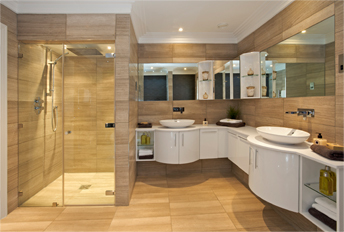 Updating your bathroom design is made easy with the consultation of InVision’s bathroom Design experts. All of our crews work for Invision, which makes them experts at remodeling Bathrooms. From start to finish, InVision will guarantee a remodeled bathroom in as few as 14 days! We can answer all of your questions and tailor our designs to your preferences. No matter what style your home is, our team of designers and Installers will build the bathroom that best suits your needs. A functional and cost efficient remodel that balances your style and your budget. An efficient, low-maintenance, and functional bathroom for the space, no matter how big or small. Our designers specialize in helping you make the most of your remodel, maximizing efficiency in floor space and storage. Free professional design in a 3D format to visualize your custom room. A complete plan, blueprints, and permits by your city so we can spend more time on construction and less on paperwork. All plumbing and electrical work required is up to code and done by professionals, including lighting, sockets, switches, appliances, rewiring, and gas pipe work. The highest level of professional and personal management as well as an open channel of communication between homeowner and construction team. Our priority is your happiness; your input is not only valued but critical to the successful completion of the remodel. We will do our best to meld your vision with the standards we have set for ourselves. These experiences have informed our development of a set series of steps to make your installation process easy and fun. Come see us today for a consultation.